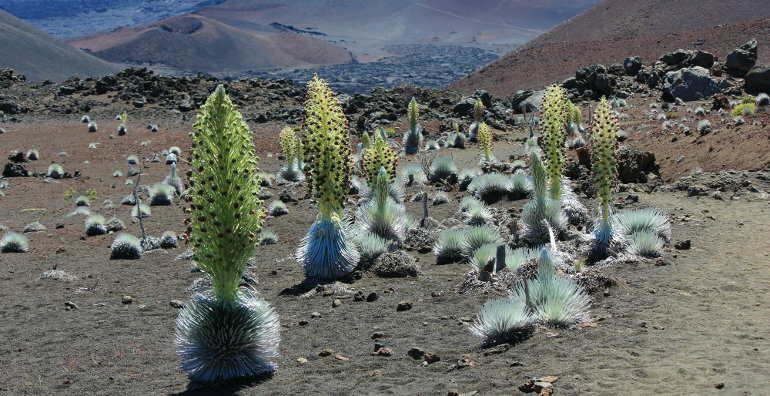 Silverswords can be found on some of the volcanic landscapes of Haleakala National Park on the island of Maui. The National Park Service (NPS), a division of the U.S. Department of the Interior, is the administrative body for the national parks in the U.S. As of this writing, there are 59 areas designated as national parks. But the NPS also administers areas with designations other than national parks, such as national monuments, national historic sites, national rivers and more. Hawaii has nine areas run by the NPS. The two national parks in Hawaii are Haleakala and Hawaii Volcanoes National Parks. There are also two national monuments, the World War II Valor in the Pacific and Honouliuli National Monuments. There are three national historical parks, named Kalaupapa, Kaloko-Honokohau and Pu`uhonua O Honaunau and one national historic site, named Pu`ukohola Heiau. And there is one national historic trail, the Ala Kahakai trail. According to theie web site, their mission is the following: "The National Park Service preserves unimpaired the natural and cultural resources and values of the National Park System for the enjoyment, education, and inspiration of this and future generations. The Park Service cooperates with partners to extend the benefits of natural and cultural resource conservation and outdoor recreation throughout this country and the world."